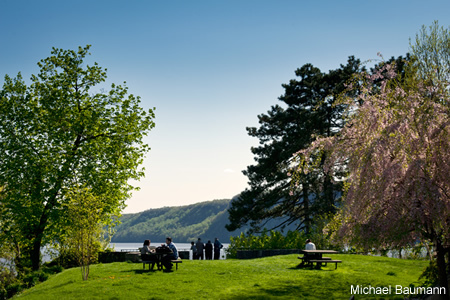 In the Rivertowns area of Hastings-on-Hudson, Dobbs Ferry, Irvington, Tarrytown and Sleepy Hollow, you’ll find numerous facilities for meeting and events, unique venues for receptions and gatherings, and plenty of activities to keep participants enthusiastic and engaged. It’s an ideal Getaway Meeting location from New York City. Located just north of the city of Yonkers on the east bank of the Hudson River and less than 20 miles from Times Square, the Rivertowns are clustered at the base of a ridge of heavily wooded hills rising up over 400 feet above the river. The five villages are linked by a common colonial past with historic sites and museums featuring history and Hudson River School painters. They are connected by the Old Croton Aqueduct, which provides a unique opportunity for team-building exercises involving hiking/bicycling between multiple towns, scenic areas and historic sites. If your attendees are located in the greater NYC area, it’s easy to get here by Metro North Railroad and Amtrak, so there’s no need for a car. Airports: The Rivertowns are under 20 minutes from laid-back Westchester County Airport; under 45 minutes from La Guardia, and under an hour from JFK International and Newark’s Liberty Airport, assuming normal traffic conditions. Hotels and Inns in the Rivertowns run the gamut from the large 439-room Marriott Westchester to the mid-sized Doubletree Tarrytown to the intimate and luxurious Castle on the Hudson, with its 24 rooms and 6 historic suites. All have meeting space available for groups – the Doubletree’s 10,000-square-foot Grand Ballroom can accommodate up to 1,200 people, while the Marriott Westchester’s 26 meeting rooms can handle events of just about any size and configuration. The Tarrytown House Estate & Conference Center, recognized by IACC as the nation’s first commercial conference center, offers numerous meeting spaces in 11 separate buildings on 26 acres, including the Mary Duke Ballroom, which can accommodate groups of up to 350. The property also includes the King Mansion, an historic guest house with 10 Georgian-style rooms, as well as 212 additional rooms and suites. At Castle on the Hudson, you can book an event or conference in the magnificent Great Hall or the Caramai Ballroom, meet informally at poolside, or have a private dinner meeting in the rosewood-paneled Arthur D. Litt Library. The region also has a selection of chain hotels in Elmsford and North Yonkers offering rooms and small meeting facilities, including a Spring Hill Suites by Marriott, a Courtyard by Marriott, Sheraton, in Tarrytown; a Hampton Inn and Extended Stay America in Elsmford, and a Residence Inn by Marriott and Hampton Inn in North Yonkers, adjacent to Hastings on Hudson. Additional hotels are available in nearby White Plains to handle any overflow. For complete listings, search our Things to Do directory or go to http://tourism.westchestergov.com/ and click on Meetings. If you want to go off-site, consider a unique venue like Sunnyside, Washington Irving’s home in Tarrytown. Its shady and expansive lawns, colorful gardens, tented courtyards, picturesque porches and galleries make perfect settings for ceremonies, cocktails and formal dinners. Nearby Lyndhurst Castle features a dazzling setting in a 19th century estate. Philipsburg Manor in Sleepy Hollow is an 18th-century working farm with a water-powered gristmill, charming mill pond, pasture, handsomely furnished manor house, 18th-century Dutch barn and garden. The glass-roofed Greenhouse is perfect for scenic evening and stand-up events of up to 100 people. The adjoining Gallery, decorated with artifacts from the collection of Historic Hudson Valley, is a larger setting suitable for formal dinners of up to 80 people. For larger groups, Tarrytown’s historic 843-seat Music Hall Theater can accommodate a wide range of events such as concerts, corporate functions, recitals, theatrical performances and more. Restaurants in the Rivertowns offer a broad range of high-caliber cuisines, and there are a number of places that are well-versed at handling groups. Blue Hill at Stone Barns, located at the Stone Barns Center for Food and Agriculture, offers a private dining room that seats up to 64 guests, as well as the HayLoft that can accommodate groups of 65-260s. In addition, meetings, outings and retreats for up to 260 guests can be accommodated on-site, with extensive team-building activities offered in conjunction with the property’s farmers and chefs. On the riverfront in Irvington is Red Hat, a popular, classy bistro with stunning river views and a roof-top lounge in good weather. Half Moon restaurant in Dobbs Ferry and Harvest on Hudson in Hastings-on-Hudson also feature great riverfront locations, with Half Moon offering a casual setting and menu and Harvest on Hudson a perfect location for any type of casual or formal business event.